The School of Nursing and Midwifery’s innovative curriculum produces graduates with the skills needed by the health industry, now and into the future. The School has a strong commitment to excellence in teaching and learning and offers a range of undergraduate, postgraduate and research programs in nursing, midwifery and health. Registered nurses and midwives can further their careers by undertaking post-registration study in specialist areas such as mental health, critical care nursing, cardiovascular nursing and health and ageing. The School also has a substantial program of research that investigates issues related to clinical practice, health, teaching and learning. Would you like some additional support during your pregnancy and also like to contribute to developing the next generation of midwives? 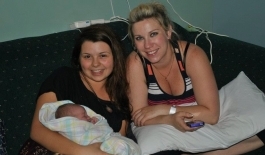 In Australia, midwifery students are required to follow women throughout their pregnancy, birth and after birth under the supervision of a midwife or doctor. Learn more about the School of Nursing and Midwifery by downloading the School brochure.